In 1901 The Evening Post Record of Real Estate Sales in Greater New York, vol. 3, no. 1, January 1901, reported property conveyances at 50th St., Nos. 224 to 232 West, 75x100.5: Mary P. Winterbottom to Harry M. Austin, and then Harry M. Austin to George Robinson. Shortly after, the Real Estate Record and Builders' Guide, vol. LXVII, no. 1726, April 13, 1901, p 644, reported, "50th st, Nos. 224 to 232 West, south side, 250 east of 8th av, old buildings, on plot 75x100.5, have been sold by Harry M. Austin to George Robinson, who will erect a 7-sty apartment house from plans by G. A. Schellenger, No. 130 Fulton st."
Construction of 226 W. 50th St., as an apartment house, was completed by 1902. Its earliest name was the St. George Apartments. 226-8 W. 50th St. was listed under this name in the New York telephone directory that year. In 1908 the New York Times, 23 Oct. 1908, reported its sale by the Robinson Construction Co.: "Parish, Fisher & Co., in conjunction with Henry M. Weill, have sold for the George Robinson Construction Company the St. George apartment house, a seven-story elevator structure, on plot 75 by 100, on the south side of Fiftieth Street, 228 feet west of Broadway. The property has been held at $225,000." Very likely the buyers in 1908 were Joseph L. Graf and his son-in-law, Alexander H. Pincus. In 1910 the New York Times, 23 March 1910, reported an exchange of properties where Paul Bonwit, president of the Bonwit Realty Co., took possession of "the eight-story apartment house 224 to 232 West Fiftieth Street, on a plot 75 by 100." The prior owners were L. & A. Pincus and Joseph L. Graf. Bonwit, however, does not seem to have retained ownership. In 1914 "Justice Lehman of the Supreme Court has appointed Alexander H. Pincus receiver of the rents of 224 to 232 West Fiftieth Street, a seven-story apartment house, on plot 75 by 100.5, pending a suit brought by Joseph L. Graf and Morris L. Goldstone to foreclose a second mortgage of $53,000. The prior mortgage was $135,000" (New York Times, 8 May 1914). By 1915 what were now the Claridge Apartments at 226 W. 50th St. were owned by the Claridge Apt. Corp. (NY), Joseph L. Graf, president, Morris L. Goldstone, vice-president, Oscar L. Graf, secretary, and Alex H. Pincus, treasurer (Polk, New York City Directory, 1915). The 1920 U. S. Census recorded 114 occupants at 226 West Fifty Street (AD 10, ED 793, sheets 7B-8B). Then in 1921 there was yet another sale of the property, "The seven-story elevator apartment house, on plot 75 by 100.5, at 228 and 230 West Fiftieth Street, known as the Claridge, has been bought by the Goldley Corporation (L. C. Goldman and A. Levy) at a reported price of $325,000. This property is situated diagonally opposite the Capitol Theatre and is owned by the Claridge Apartment Company, James L Graf, President. James J. Crowe negotiated the transaction." It was at this point that the Claridge Apts. became Mansfield Hall. The 1930 U. S. Census recorded 230 lodgers. 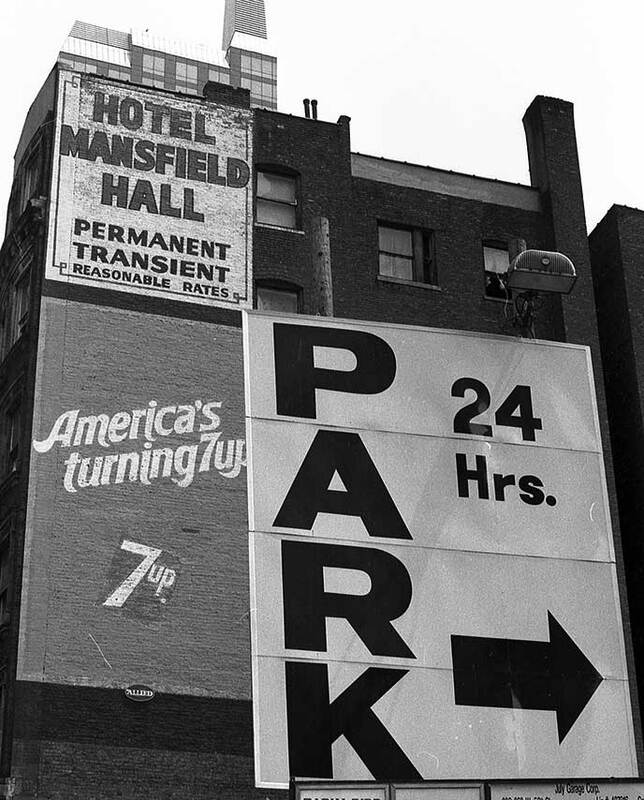 Clearly, by this time it was the Hotel Mansfield Hall. The 1940 census enumerated only 74 residents at the "Mansfield Hotel." Mansfield Hall at 226 W. 50th St. continued to be listed in the Manhattan telephone directory through 1999. In 2002 it appeared as the renovated Amsterdam Court Hotel with 136 guest rooms. You can visit their website at http://www.amsterdamcourtnyc.com/. Some of the significant figures in the timeline of Mansfield Hall were George Robinson, Joseph L. Graf, Alexander H. Pincus, and Louis C. Goldman. Joseph Leroy Graf (1853-1929) was an immigrant from Bohemia who became a dealer in human hair goods, than a real estate entrepreneur with his son, Oscar L. Graf, and his son-in-law, Alexander H. Pincus. According to his passport application in 1912 Joseph L. Graf was born 12 April 1853 in Pilsen, Bohemia, Austria, and emigrated to the U. S. from Bremen, Germany, Oct. 1868. Graf's estate was valued as follows in the New York Times, 21 Aug. 1932, "Joseph L. Graf, financier, who died Sept. 6, 1929, left an estate appraised yesterday at $1,890,630 gross and $1,775,905 net. ... His son, Oscar L. Graf, received $75,000 cash and shared the principal of the residue with Claudia Bloom, Gertrude Cohn and May Pincus, daughters. ..."
Alexander Harry Pincus (1874-1967) married May Graf 26 Nov. 1907. The couple were recorded in the 1920 U. S. Census on the same sheet (ED 799, sheet 4A) with Joseph L. Graf and Oscar L. Graf, all living at 200 W. 54th St., NYC. The Grafs are identified as manufacturers, while Pincus is a real estate agent. The loving couple seemed to have broken up a few years later, considering this tale from New York Times, 30 May 1924, "Alexander H. Pincus, a wealthy realty man, was directed by Supreme Court Justice Delehanty yesterday to pay $1,250 a month alimony and $2,500 counsel fees to his wife, Mrs. May Graf Pincus, pending a suit for divorce. Mrs. Pincus asked $25,000 a year. Pincus declared in an affidavit that the suit was based on a "frame-up" in which one of his tenants, Audrey Maple, a musical comedy actress, took part. ... Pincus alleged that he had an interest in the building at 42 West Forty-sixth Street, and that Miss Maple had been a tenant there for some time. He said that on the day in question she telephoned him to call to see about a lease in another house he owned at 30 West Fifty-first Street. He found her in negligée, he said, and another woman was with her, but that the latter left as soon as he entered. Pincus stated that the woman called him into the bedroom, saying that she wanted to show him the condition of her room as her reason for desiring to leave. He declared that as soon as he entered four men came into the apartment through the unlocked door. ... Mrs. Pincus stated that she married Pincus in 1907 and that while they were on their honeymoon in Paris he flirted with another woman at Maxim's. She declared that her husband continually humiliated her and had publicly stated that she 'had the mentality of a child of 15.' She alleged that he was worth more than $1,000,000 and had $50,000 interest in the Imperial Theatre on West Forty-fifth Street. Pincus asserted that his wife's father, Joseph L. Graf, is 'immensely wealthy' and that his difficulties with his wife had been due to her father's demands that she take his part in disputes with her husband over realty transactions." As a young man Louis C. Goldman (1886?-1946) entered his father's stationary business, Charles Goldman & Son, located at 80 West Broadway. At a later date Louis C. Goldman formed a real estate partnership with Louis Levy called Goldley Corp. Goldman (sometimes spelled with two Ms, Goldmann) registered for the World War I draft in 1918 when he declared that he was a native born citizen born 11 Nov. 1884. He also registered for the World War II draft in 1942, but gave his birth date there as 11 Nov. 1886. In 1942 Louis C. Goldman was 56 years old, lived at 680 West End Ave., Manhattan, and was employed as "Management, Hotel Chesterfield, 130 W. 49th St., NYC." A short notice in the New York Times, 25 Nov. 1946, read, "Louis C. Goldmann of 680 West End Avenue, owner of the Hotel Chesterfield, builder and real estate man, died Saturday in Lenox Hill Hospital at the age of 60. He leaves a widow, Estelle; a daughter, Mrs. Ruth Rosen; a brother Jack Goldmann and a sister, Mrs. Anna Moret." According to Nancy Bachana at http://nancybachana.blogspot.com/ the architect, G. A. Schellenger, was Gilbert Alphonso Schellenger, born in 1845, in the town of Stockholm, St. Lawrence County, N. Y. "Between 1882 and 1904, he designed hundreds of residences and commercial lofts, spanning every neighborhood on the island [Manhattan]. Best documented are his forty-five rows of townhouses still standing in the Upper West Side. ... Schellenger died suddenly in 1921, while visiting a sister in Massachusetts, and he was buried there. His firm and his papers died with him. He left no children, and he left no will." The following is quoted from the New York City Landmarks Preservation Commission report Upper West Side / Central Park West Historic District Designation Report, 24 April 1990: "Gilbert A. Schellenger was established as an architect in New York by 1882. He had an extremely prolific career during the 1880s and '90s. Examples of Schellenger's work can be found in what are now the Carnegie Hill, Greenwich Village, Ladies Mile, and Upper East Side Historic Districts. In addition, he was the second most prolific architect in the Upper West Side/Central Park West Historic District, with work spanning almost twenty years. Working for a number of developers in the district, he was responsible for numerous rows of houses and flats, as well as a tenement. His designs were primarily executed in the Renaissance Revival style, although he also used the neo-Grec, Queen Anne, and Romanesque Revival styles."